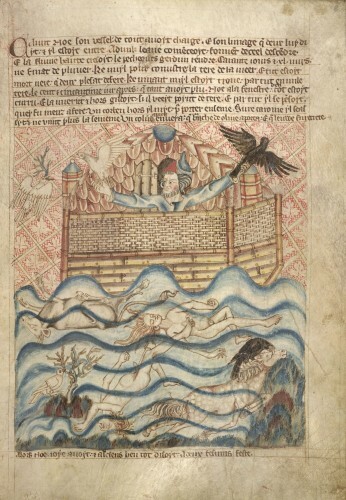 Within the unique sequence of illustrations preserved in this manuscript, apocryphal episodes and details drawn from late medieval life have been woven into a biblical narrative extending from Creation to the Last Judgment. The Dominican friar for whom it was made, perhaps as a teaching aid for the rich and powerful, is depicted at the opening of the volume instructing the artist: ‘Now do it well and thoroughly, for it will be shown to important people’. To help in his instruction the illustrations are accompanied by brief explanatory texts in Anglo-Norman French, the literary language most familiar to contemporary English nobles. Separate episodes are sometimes conflated in a single illustration: for example, the dove is seen being released by Noah, finding an olive branch, and returning with it in its mouth.